Here you can download the latest stable version of ProppFrexx ONAIR. In order to download ProppFrexx ONAIR, we request you to fill out the following form and press the related 'Download' button. A link to the download file will be send to your given email address (make sure to enable the 'radio42.com' domain in your local mail settings). ProppFrexx ONAIR runs in Demo-Mode if you do not enter a valid registration key at startup. The Demo-Mode contains all features of the Enterprise-Edition, but has two limitations: 1. a short 2kHz beep sound is played every so often, 2. it terminates automatcially after 3 hours of consecutive use (a manual restart is required to continue). ProppFrexx ONAIR is licensed not sold. In order to use ProppFrexx ONAIR on a regular basis, you need to purchase a license. Please carefully read the End User License Agreement before you install the software. By installing the Software and clicking the "Register" button respectively, which is a symbol of your signature, you agree to accept the terms of this License Agreement. Note: By installing the Software AND clicking the "Register" button, you agree to accept, that you are waving ALL of your cancellation and revocation rights. This means, that NO refund of any money (e.g. your paid license fee) is made once you registered the software - that's why you can try it before you buy it. 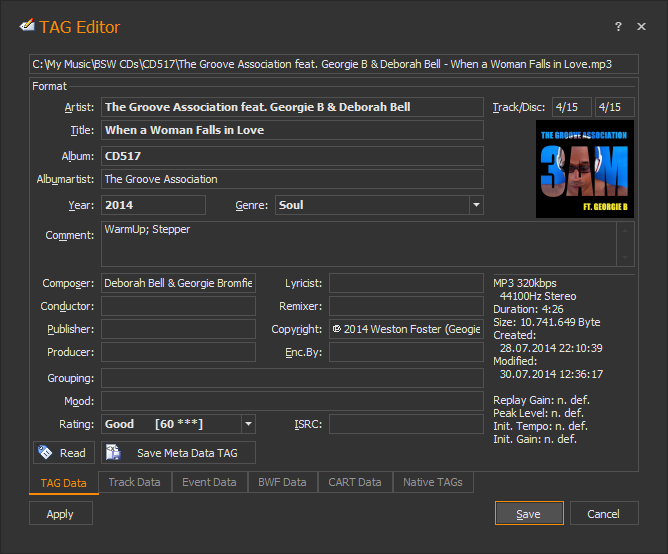 ProppFrexx Tagger is a standalone meta data editor which allows you to edit any available TAG data (ID3v1/v2, OGG Vorbis, APE, WMA, ASF, M4A, iTunes, RIFF INFO, BWF BEXT and CART etc.) within your audio files. ProppFrexx Tagger is also contained within the ProppFrexx ONAIR suite, however, you can download it here seperately as a standalone tool, if you don't want to install or use ProppFrexx ONAIR. And the best is - it is free*! You can freely use ProppFrexx Tagger. No license is required. The Tagger not only allows you to maintain any standard TAGs (like Artist, Title, Composer, ISRC, Grouping, Mood, Genre, CoverArt etc. ), but also gives you the ability to pre-define cue- or hook-points, volume envelops, track/voice inserts etc. Beside storing the meta data directly within your audio file, the ProppFrexx Tagger also allows you to save separate meta data files along with the audio (if you don't want to make any modification to your source files). No setup is required. All files are provided in a single zip file, which can be unpacked wherever wanted. ProppFrexx Playout is the branded Sound-Design Kiosk, Store, Hotel, Restaurant, Shop jukebox like playout system. 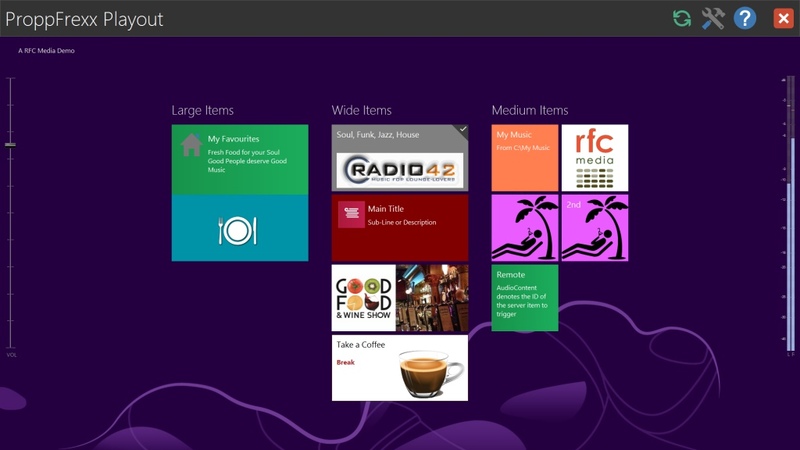 ProppFrexx Playout is designed as a modern Windows Tile application, which is fully touch enabled and can be used as an application to serve either direct or indirect playout of audio (music) content in a kiosk like fashion. The look and feel is fully customizable to individually adjust the entire design to the related company (or brand) using this application. The application is so simple to use, that it can easily be operated by really everyone (from a shop assistant, bartender or dishwasher to a top level manager). Your Sound Design brought directly into your shop, restaurant, store etc. 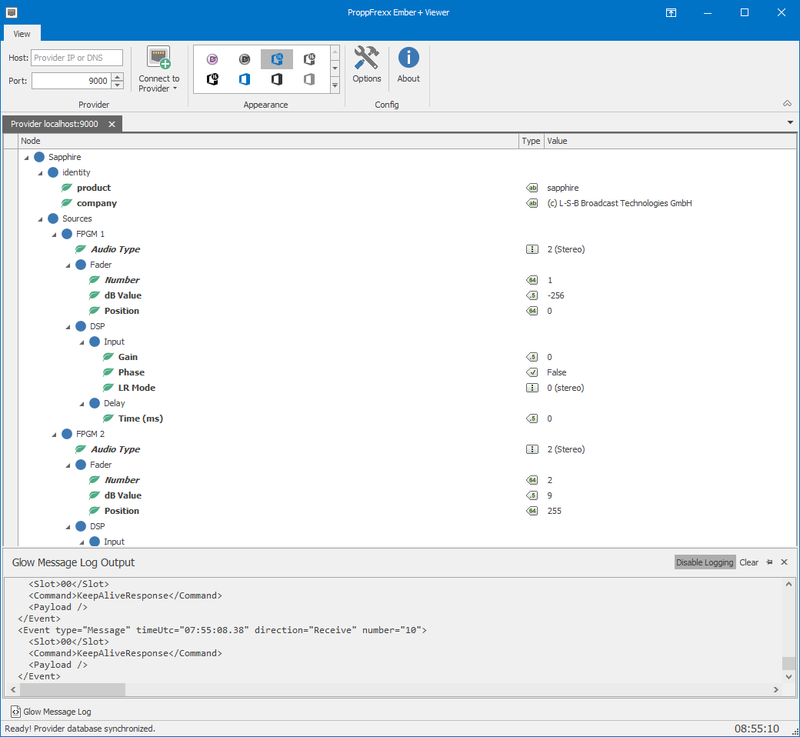 It can be run as a standalone application with direct playout capabilities connected to an in-house music unit or as a pure remote unit, which triggers the playout on another (server) instance, which might be connected to a complex multi-output music system; or anything in between (mixed hybrid mode). The ProppFrexx Ember+ Viewer is a standalone generic Ember+ consumer which allows browsing and editing of any Ember+ provider. Ember+ is an initiative out of the Lawo Group and defines a control protocol for easy interaction with any equipment. The ProppFrexx Ember+ Viewer is a small and tiny Ember+ consumer which lets you quickly connected to an Ember+ provider for inspecting his provided database of nodes and parameters. It can be download here seperately as a standalone tool. And the best is - it is free*! You can freely use the ProppFrexx Ember+ Viewer. No license is required. 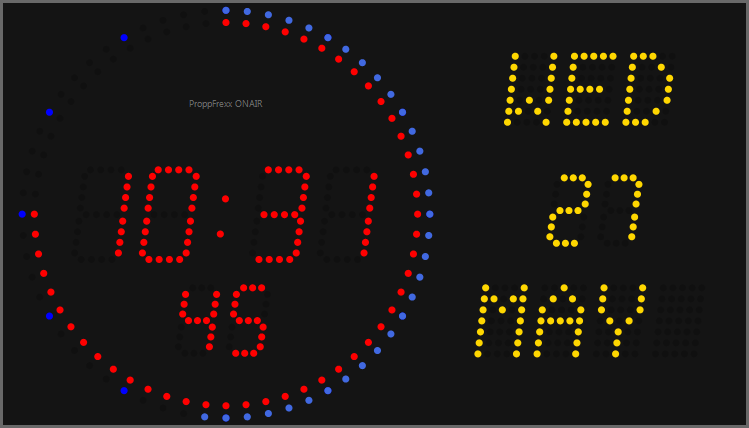 ProppFrexx Time is a standalone Gorgy-Timing inspired clock control in the style of the classic LEDI® layout. ProppFrexx Time is also contained within the ProppFrexx ONAIR suite, however, you can download it here seperately as a standalone tool, if you don't want to install or use ProppFrexx ONAIR. And the best is - it is free*! You can freely use ProppFrexx Time. No license is required. The ProppFrexx WebRadio Player is a simple but efficient and high quality internet stream player, that is freely customizable. 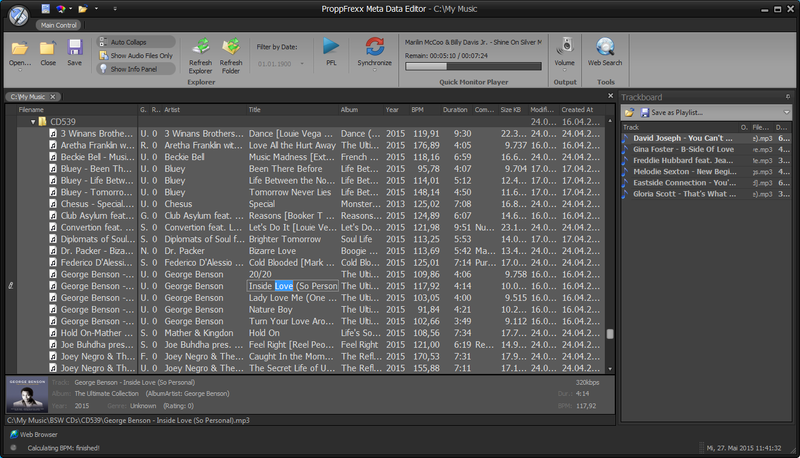 The ProppFrexx WebRadio Player is NOT contained within the ProppFrexx ONAIR suite. You can distribute the player freely to your customers as a standalone player when using ProppFrexx ONAIR. And the best is - it is free*! You can freely use the WebRadio Player. No license is required. * Free in this case means, that you can use it for personal use without any further license fees. It does NOT mean that you are free to change, copy, redistribute, share or use it for any purpose.